(I wrote this as a Christmas gift for Melissa. It was inspired by moment when we were packing our things in California and my darling wife held a rolling pin aloft just before stowing it and said “you know where I’d like to shove this” and I knew exactly what she had in mind and where she wanted to put it. I thought I might add more chapters but if I don’t get inspired, this little ditty stands on its own). It was their song, Merle Haggard’s classic account of an angelic mother and her demonic son who rewarded her goodness with shame and scandal. Neighbors of a shabby studio apartment on the seedy edge of Hickory, North Carolina, knew every syllable by heart. The guy in 228-J played it at 10:13 every Thursday night for the past 13 years, four months and 21 days. “… no one could turn me right but Mama tried…” she heard through the apartment’s thin door. A wave of warmth pushed back the Christmas Eve chill. She was the Rolling Pin Killer, and she was on the lam. She was right where the authorities would look for her first, the filthy warren of her soulmate, a failed newspaperman who devoted his every waking hour to securing her release from the Joliet Prison for Women. She couldn’t remember ever being this excited as she began to rap upon the door, but remembered to pause till 15 seconds after the last guitar chord faded. The time he threw the landlord’s puppy through a plate-glass window for interrupting their song became the stuff of legend once the tabloids got ahold of it. It took two sets of hard knocks before she heard him picking his way through his personal junkyard on the way to the door. She stepped aside as a plume of dust poured from the opening apartment door. He didn’t get out much. “Honey, it’s me!” she cried, jumping toward the doorway and crashing into his sunken chest. Can’t be a dream, he thought. I haven’t slept in five days. CNN was running updates on her cunning jailbreak every 12 minutes. He’d watched it all. They knew about as much as he did, but unlike him they had 24 hours of airtime to fill. “Wow, she’s really bulked up inside,” he thought as her muscled arms nearly squeezed his breath away. Reflexively, he threw a hand between their lips, knowing her reunion kiss would drain his last ounce of sanity. Agnes Butterfly was the name on her birth certificate, but everybody knew her as Aggie. Her conviction in the diabolical slayings of 17 corporate executives (each one felled by a fatally impacted bowel) had transfixed the nation. Two trials and four appeals could not sway the U.S. justice system from its insistence that she was the Rolling Pin Killer. As far as he was concerned, though, the case was all circumstantial and ripe for appeals. After all, the one person she did vow to violate with a rolling pin was very much alive. He updated his blog, AggieWasFramed.com, 17 times a day with fresh allegations of judicial missteps and police wrongdoing. He threw all the revenue from the site’s 17 million hits a day into Aggie’s defense fund, but $314.42 a week didn’t buy much legal advice. But in classic Hollywood style, a determined gaggle of law students took on her case and smothered the justice system with every imaginable legal ploy, and many previously unimagined. It all paid off six weeks ago, when the U.S. Supreme Court agreed to take on her case. What on earth, could have pushed her to this, he wondered as his breathing returned. A couple days ago I was at work putting together a couple items for our “star watch” celebrity column when a statement from Will Smith struck me: he said he’d told his daughter she could grow up to be president, but now he actually believes it. Here’s a guy, Hollywood Movie Star and successful beyond most of our wildest dreams, revealing something I suspect a lot of black people are thinking today: America, finally, feels like our country now. As a white guy I could never presume to know what it’s like to be black in the United States of America, but I suspect it’s been like this: everything we have, The Man can take away. The man dragged us here in chains and kept us there for 300 years. Fought a war that supposedly set us “free” but treated us like dirt for another 100 years. It’s their country, we just live in it. A single Ivy League-educated half-white paid-up member of the nation’s intellectual and financial elite will not fundamentally change America’s race equation. But Barack Obama’s inauguration will say one thing: we don’t have to be the way we’ve always been. It’s probably dangerous to read too much into what’s happening today: to be the first black president of the United States, you have to be Barack Obama, a guy curiously unaffected by impossible odds against him. Think of what he was up against 18 months ago. Beyond being a member of a racial minority with foreign first and last names and a notorious dictator’s middle name, he had almost no track record in politics. He wasn’t from an established political family. He was a complete outsider. A guy like him finding a way to become president forces us to widen our ideas about what is possible and impossible. Obama had no chance, and yet here we are today. Cynicism seems pretty empty in the face of that. So, how good is your cat? 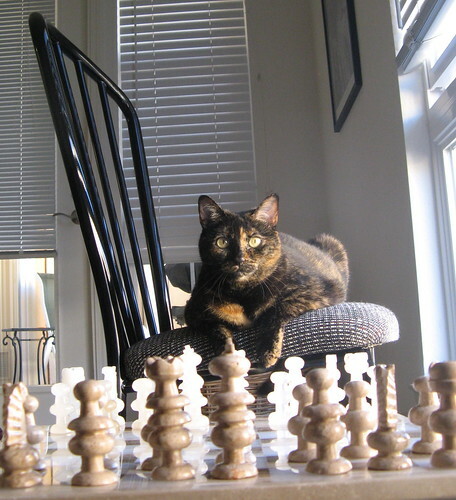 I suppose I could beat the cat at chess. 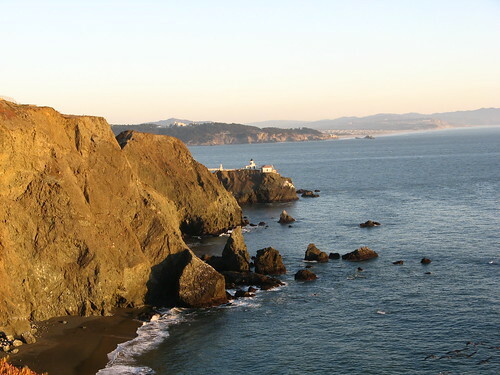 Marin Headlands, originally uploaded by busybeingborn. Pretty pic from a couple months back. How’d you like this for a front porch? 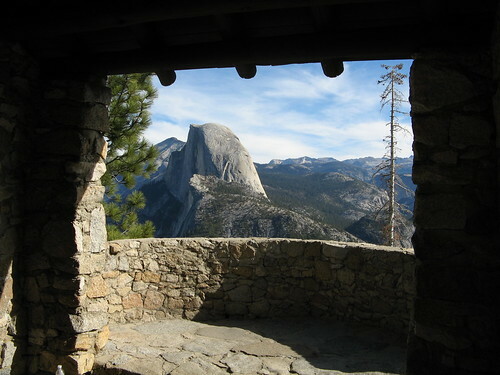 Half Dome from the Geology Hut, originally uploaded by busybeingborn. Took some pretty pictures at Yosemite yesterday. Evidence here. Snow in P-town, originally uploaded by busybeingborn. Ed, my stepdad in the Peoria area (downstate from Chicago) and my mom have a place in the country with a nice paved driveway. He even has one of those mini-bulldozers to plow his drive. 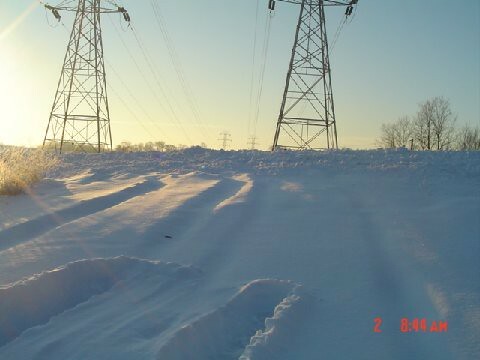 But when the big snows come, the county snowplows leave a ridge of frozen, filthy snow that has the folks locked on their land for now. The tracks in the snow here are as far as the ol’ Jeep Grand Cherokee could make it, apparently. Haven’t done this since January so it’s time to point out all the good, friendly people who link to these friendly environs. PJ Net — Blog of the Public Journalism Network. Tinsley Spice — Santa Cruz, Ca., group blog. Suburban Guerrilla — former newsie’s politics blog, mostly Democratic. Beaneball — A baseball blog. The Media Drop — Commentary by another blogger named Tom. 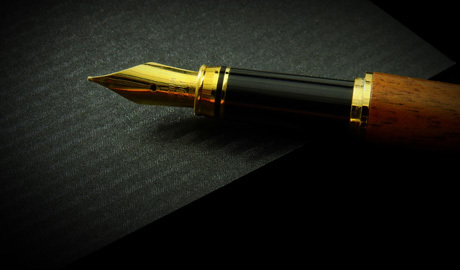 Hypergene Media Blog — All about participatory journalism. True Blog — Miko Matsumura’s Java blog. Just a Gwailo — Canadian techie guy’s blog. Madeleine Begun Kane tracks presidential strangeness. PR meets the WWW — Constantin Basturea’s public relations blog. Cyberwriter — German media blogger. Some of the lefty blogs have started calling the “civilian contractors” in Iraq mercenaries. The idea being: they’re mostly ex-military and they’re in Iraq for the big bucks. Guns for hire, mainly. But my understanding of the term is that a mercenary would fight under any flag in any land if the paycheck is big enough. Does anybody seriously think former Navy Seals are going to hire on for brushfire wars in central Africa or take jobs protecting drug kingpins in Colombia? Could happen, I suppose, but it seems unlikely. What’s really happening in Iraq is that guys who signed up for enormous risk as U.S. special-ops troops are finally getting some of the monetary rewards denied them by us, the U.S. taxpayers. Having all these private employees and all their lethal training outside Pentagon control raises any number of worrisome issues, but that doesn’t really mean they’ve become mercenaries in the widest meaning of the term. So keep an eye out: “mercenary” has a politically charged meaning these days … it’s become a fresh buzzword that we should be keeping out of news copy, except in direct quotes.